Google Alerts is a service that will send you emails - or generate an RSS feed - when new results show up for a designated topic. It can be very useful to writers research a specific topic. If you are an author you can also use it to notify of alerts related to your name or book. You can change options for each alert you set up, such as type of content sources, frequency of notifications, number of results, etc. You can edit and delete alerts once they have been created. The Google Alerts has a number of suggested topic ideas on the Google Alerts homepage. 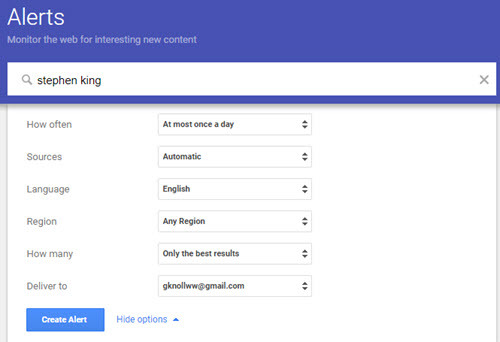 You can also enter keywords to create a Google Alert. Let's say you want a Google Alert for author Stephen King. You enter "Stephen King" in the Alert search box. You can set an alert with the default option by select the "Create Alert" button. The bottom of the page has an Alert preview that shows you the type of content you will receive. How Often: If you want lots of alert choose "as-it-happens." The default option is "at most once a day." You can also get alerts just once a week. Sources: The default is "automatic" which includes all the sources. You can also select to receive alerts from blogs, news, video, books, discussion and financial sources. Language: English is the default. There are many other country options. Region: You can narrow the results to a specific country. How Many: You have two choices. You can opt to receive "only the best results" or you can receive all the results. Deliver To: The options here are to select an email box or have an RSS feed generated. Once you have create a Google Alert you can edit and delete them from the Google Alert page. Deleting an alert is easy. Just click the trash can located next to the Alert. You have the option to "undo" if you delete one of your Google Alerts by mistake. Select the pen-like edit icon if you want to modify one of your Google Alerts. If you click the star-shaped "Settings" button on your Google Alerts page you can set a delivery time for your Google Alerts. Google has a Google Alert help page here. They note that if you are using Gmail you should add the Google Alerts address to your contacts.